Crafters gathered to share and care in November with all manner of activities: Knitting, Marbling Paper, Marbling Fabric, Weaving, Doll Making, Teddy Making, Quilting, Sewing. It was a jam packed session. As ever, huge thanks to Irene and Tony for the brilliant Barista and Waitressing service – you guys ROCK! And a big thank you to Shirley for the great photos and notes. There was another Meat Raffle with the great meat from Geeveston supplier. The lucky winners were Bruce and Carol. Pauline conducted a Marbling with Shaving Foam mini-workshop and it looked very popular, it was certainly colourful and fun! And the hall verandah was just the place to dry and display. Photos follow after the general photos, please scroll down to them. Show and Tell was as varied as ever. Janet’s jacket was made using all the knowledge gained from the group – that is the value of gathering to care and share. Josiane showed alpaca yarn plied with Nikki’s colourful blends of fibre. Elke’s idea of knitting with 3 different balls of yarn then finishing off with shropshire buttons. Jennifer had an array of fish beanies – knitted for her 9 grandchildren. Wilma had a woven bag fresh off her knitter’s loom and Josiane had scarves to show – again from her knitter’s loom. Kerry showed her first ever woven scarf, inspired by Wilma, and Helen showed Quilts and Dolls. Megan had prize winning yarns to display. Great effort everyone, such a lot of fun. Enjoy the photos, let me know if you have any information to add. A school of Fish Beanies. Some delicate work going on. Quilting – another one ready to go. 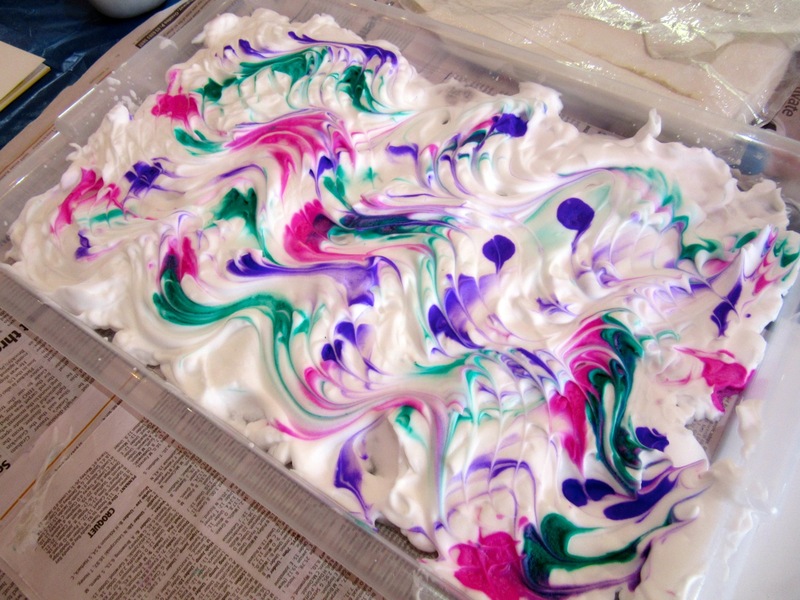 Marbling session – dye and shaving foam. Oh mi goodness, that looks delicious.